Hope gets involved at a homeless shelter, then suddenly sees everyone else as an evil capitalist pig. One of the cars is broken, so Melissa comes to watch the kids while Hope rushes Michael off to work. Things seem very hectic in the house. On the drive in, Michael and Hope bat around very mundane household things until Hope spots a homeless man rummaging in a trash can. Hope turns to wondering why nothing's been done about it, asking why Micheal isn't more horrified by it. Hope goes to drop off some clothes at the homeless shelter and is overwhelmed by the chaos inside. Hope begins questioning about volunteer opportunities, but none of them align with her schedule, so she kind of adopts a free form style and tries reading some books to the kids hanging around without supervision. She begins talking to one of the children and the kid rifles through her purse and takes a LifeSaver before the kids wander off, leaving her alone. Michael comes home and finds that there's no dinner and Hope is poring over stuff that she's going to give away. Michael asks her about the shelter and what she did there and she shares how overwhelming it felt. Later, Hope is reading to a larger group of children and meets up again with the original LifeSaver stealing urchin, Jenna. The kid knows how to read and so takes over the storybook. Jenna's mother approaches and tells Hope that Jenna taught herself how to read and that she had lost her job after going on maternity leave to have Jimmy, the other child. For some reason, the woman won't tell Hope her name. That night, Hope and Michael have Melissa over for dinner to pay her back for babysitting that morning. Then it comes out that they want Melissa to photograph the party and she knuckles under. Melissa shares that Susannah is in town with Emma and Hope mentions that she invited her and Emma to the party. They talk a little about Gary and Melissa is obviously still a little sad. Back at the shelter, Hope follows Alice around and finds out that the woman she met was named Mary Kennedy. Hope comes up with the idea of trying to find a job for Mary since she had mentioned working in a law firm earlier. Late at night, Hope rambles on about Mary and her troubles, keeping Michael awake and pestering him to see if there's an opening at DAA for a receptionist. Michael finally remembers that there might be an opening coming up and agrees to look into it. Hope drives Mary and the kids in to interview with Michael and it seems to go fairly well. They drop by Hope's home on the way back to the shelter and Hope gets to play hostess, distributing food to all while Jenna and Janey play together. Janey asks if Jenna can come to the party and Hope extends an invitation. Mary seems genuinely grateful that Hope took the time to be with her that day and for inviting her into the home. A montage of shots following Hope as she gets ready for the party and does things at the shelter follow. Michael returns home late and tired from work and Hope pries it out of him that he doesn't know anything about the job opening and that it could be a while longer before anything turns up. At the shelter, Jimmy is sick somewhat and Mary tries hard to be upbeat about the news that the job is still uncertain. 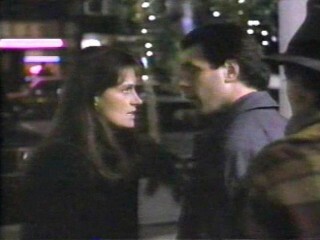 Michael and Hope go to dinner with Billy and Ellyn and as they're leaving, a homeless man approaches them and asks for money for his sick family in Spanish. Hope translates and Michael wants a little more evidence, such as to see the family, while Hope just wants him to fork over cash. They get into an argument about it that turns very nasty. Hope returns to the shelter and finds Mary's room empty. It seems that her time was up and she left with no sign of where she was going. Hope approaches Alice about it and the cold reality of how hard it is to take care of everyone becomes apparent in their dialogue. Janey's birthday party is a happy occasion, but Hope immediately turns back to worry about Mary as soon as she and Michael are alone. Hope goes out looking through various areas where the homeless congregate to find Mary, but couldn't. She returns to the shelter and reads some more to the children. The homeless people were dressed rather well. And someone stuck Michael in a bad looking brown sweater with a V-neck and a strange design on it. This particular show, as annoying and preachy as it might seem be, shines an inescapable light on the obvious. It's all about haves and have nots and we can only live "Hopeless, Faithless and Charityless." It is one of the seminal push-button episodes, if it is looked at as a study of what happened to the baby boomer dream generation. We would save the world because we had the answers. But as we grew into positions of power and responsibility, not only did it turn out that we didn't have the answers. Hope asks Michael if he's sure he's not one of the bad guys? And he says, no, he's not sure. That little moment, I think is one of "the" themes running through the entire series. The self doubt of the generation slouching toward consciousness. And "after us what rough beast...?" If there was a FortySomething, Michael would be sure. This is my least favorite episode of all time. Period. I had trouble watching it the whole way through. I kept seeing another emotional fit coming on and reaching for the fast forward button. How could Janey be turning four when in the episode "our wedding" she had already just turned four? Hope works up to a righteous snit awfully fast on this account. That is, she's suddenly horrified by life on the streets, but we never really saw this side of her before. She's been sitting around on a good chunk of change since Michael got promoted a year ago, but this is the first we see of public service from her. Why didn't she get involved with Susannah's work? A little more lead in to this might have been more effective. Bob observation, 2-4-2007: I'm exasperated by the scene where the guy is asking for money and Hope is emotionally bullying Michael: "Give this man money or I will condemn you as an evil, heartless monster." Michael has already been established in prior episodes as a caring person who gives to the less fortunate. For me (and apparently for Michael), the question of whether to give to panhandlers comes down to this: What people want isn't necessarily what they need. Maybe they want enough money to buy some wine when what they need is enough money for food, clothing and shelter. I believe that if you want to help, you should donate time, possessions and money to charities that help the poor. The problem is, even if you just wrote a check to the shelter, it doesn't ease the guilt in that wrenching moment when someone holds out their hand to you. That's what Hope seems to be looking for: instant gratification instead of taking a practical approach. I Googled the questions, "Should I give to beggars/panhandlers?" I came up with a handful of charitable and Christian web sites, and their answers discussed the wants-vs-needs problem I mentioned. In the end, they decided, it is better to be fooled by professional panhandlers (and there are many) than to possibly deny help to someone who needs it. Myself, I've made peace with walking past beggars without stopping, and instead giving to charities that help them.